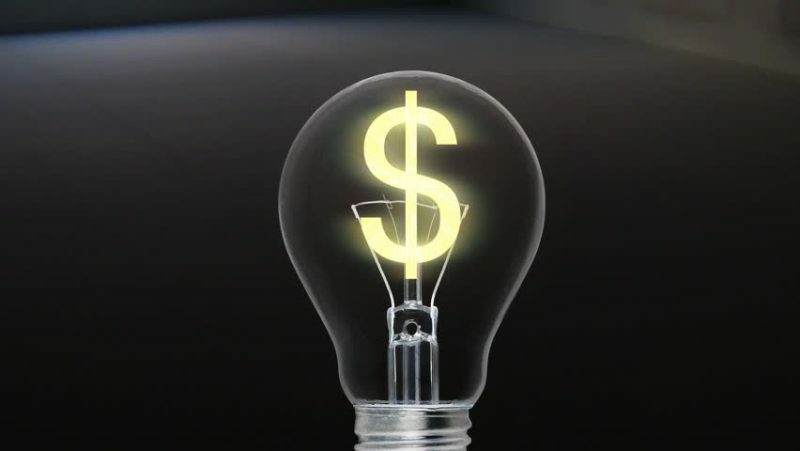 > How Do LED Light Bulbs Reduce Business Expenses? How Do LED Light Bulbs Reduce Business Expenses? LED light bulbs have grown increasingly popular in recent years and are becoming a staple in homes and businesses. Although the prices of LED bulbs have decreased since they first appeared on the market, they are still slightly more expensive to purchase than traditional incandescent and fluorescent bulbs. Even with a higher upfront cost, LEDs can actually help your business save money in the long run! HomElectrical is here to show you how to get the best return on investment with LED lighting! How Does LED Light Output Compare to Other Bulbs? LED bulbs have a better light output than traditional incandescent and fluorescent bulbs. All bulbs will eventually decrease their light output in a process, referred to as lumen depreciation. Lumen depreciation causes lights to appear dimmer over time. While traditional light bulbs grow dim relatively quickly, LED bulbs retain their brightness, which reduces the need to change light bulbs as frequently.In fact, LED light bulbs have a significantly longer lifespan. Although light output can vary between bulbs, LEDs last for approximately 25,000 hours while fluorescent light bulbs last for only 7,000 hours and incandescent bulbs for only 2,000 hours. Light bulb longevity and brightness are extremely important for businesses because, unlike households, company buildings leave their lights on during all hours of the day. How Do LED Light Bulbs Use Less Energy? You can save up to 80% on energy costs by switching to LED bulbs. LED stands for “light-emitting diodes,” which are sparked when electricity passes through semi-conductors. In contrast, incandescent bulbs create light using heat. This means that about 90% of electricity used in incandescent bulbs creates heat instead of light. 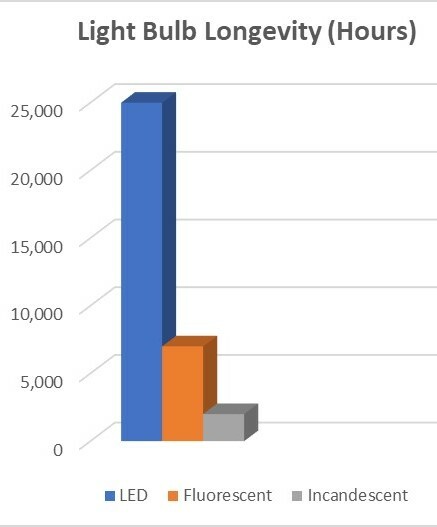 LEDs require only 1/7 of the electricity used by incandescents and approximately 2/5 of the energy used by fluorescents to produce the same amount of light. 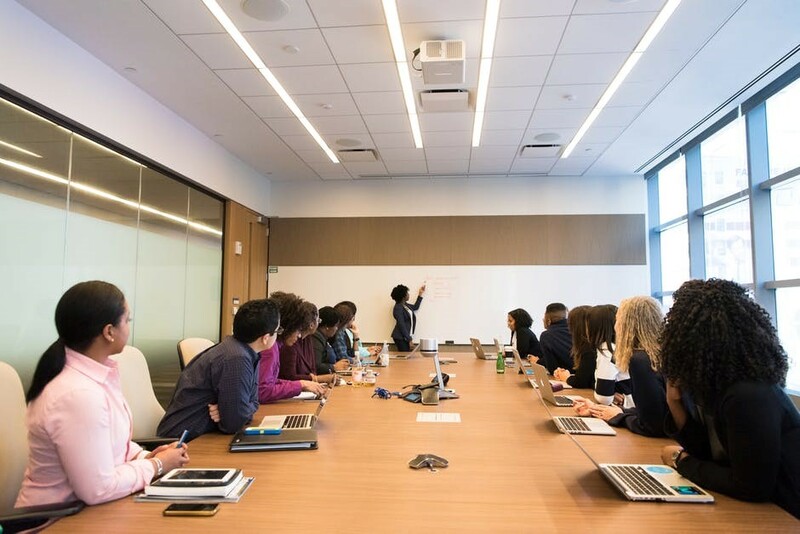 Using less electricity will lower overall expense while simultaneously helping the environment, benefitting both your company’s image and financial savings. How Difficult Is It to Switch to LEDs? 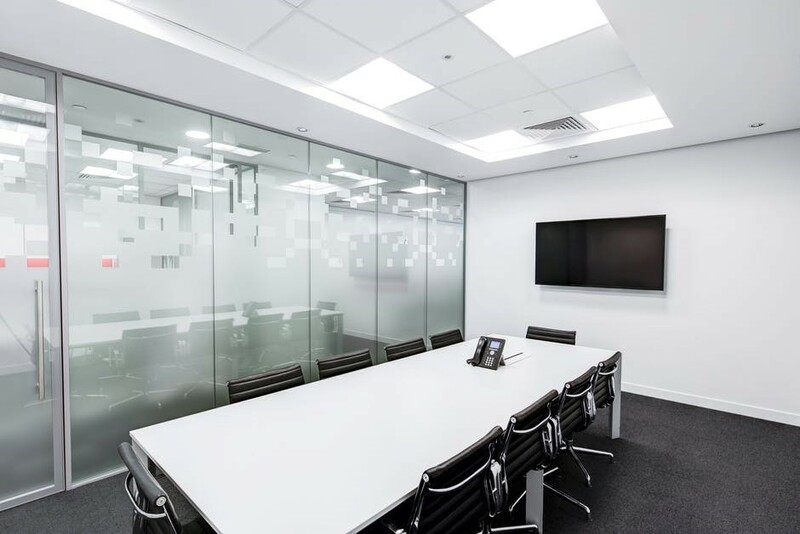 Many business owners fear that switching to LEDs will require them to replace all light fixtures, but this is not the case. Of course, many businesses will opt to install new LED troffers or LED panels. These lighting fixtures provide a sleek look with no hot spots and last longer than traditional light panels. However, an LED bulb usually has the same base of a light bulb that it is replacing, such as the most common base: E26. Because of this easy conversion, you don’t have to change out complete fixtures and can instead retrofit them! How Would Retrofitting My Lighting Fixtures Help My Business? Upgrading to LED and advancing the lighting technology for your business can be easy by retrofitting your current lighting fixtures! Retrofitting is when you remove your current fixture’s internal components and replace them with LED technology. LED lights are more efficient, reliable, and give off a more consistent light output. Learn how to upgrade your lighting fixtures with our Retrofit Guide! All incandescent light bulbs release small amounts of UV radiation. LED light bulbs do not, making them safer for the consumer. UV radiation can especially hurt businesses that sell items with a shelf-life. This includes perishable goods, such as meat and other food items. If your business sells any of these, it would be wise to switch to LEDs to improve product quality and reduce waste. Unlike LEDs, fluorescent light bulbs contain mercury. The mercury content makes fluorescent lights more dangerous if they were to fall, and they are more difficult to dispose of safely. LEDs do not contain the same hazardous materials and are better for you and the environment. 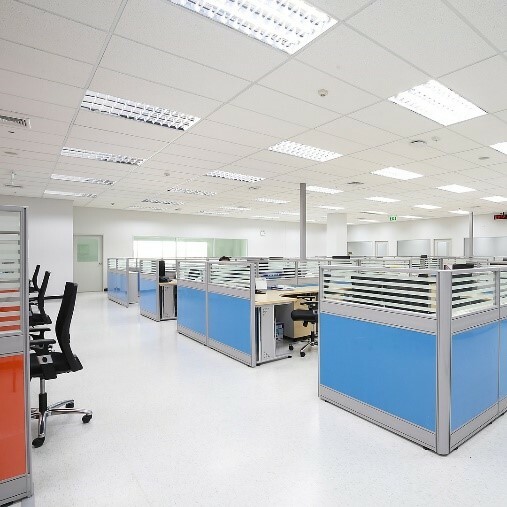 How Can LEDs Improve Business Atmosphere? LEDs produce a clear, white light that increases visibility, which is enhanced by the directional control of LED light bulbs. While incandescents release light in all directions, LEDs are typically focused at a 160-degree angle, guaranteeing that you get light where you need it. Controlled lighting will provide employees with a pure light source while using fewer bulbs. 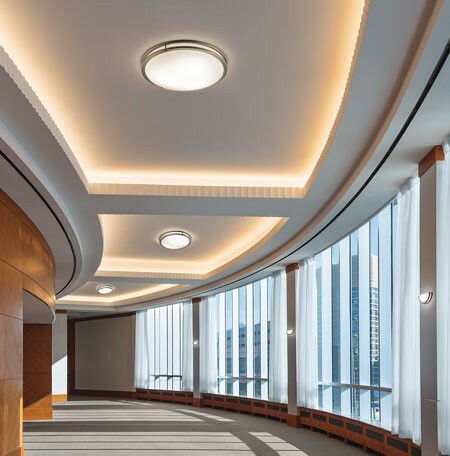 LEDs also have more variety in color temperature than incandescents and fluorescents, which can help employees stay alert and reduce headaches. Most businesses use a color temperature of 4000K, 4100K, or 5000K to have a bright and timeless light in the office. LEDs come in a variety of shapes and colors. Many LEDs also feature dimming capabilities, so if you have a dimmer switch installed, you can change the light intensity in any room. Keep in mind that certain environments require different aesthetics. For instance, display rooms may need bright and dim lights in specific regions, while hotels and restaurants may want to change the brightness of dining and welcome areas based on the time of day. With dim lighting, you can save even more money by further reducing the energy flow to the light source, which will in turn save money. Incandescent and fluorescent bulbs create a lot more heat than LEDs, so they raise the temperature in your business more than LEDs, too. Traditional light bulbs make rooms uncomfortably hot and require businesses to use more air conditioning to maintain a normal temperature. 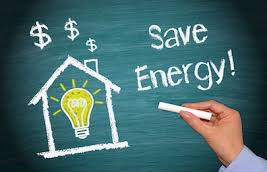 You can reduce the amount of money you spend on air conditioning simply by switching to an LED light source. While lowering your utilities bill, you can also reduce complaints from clients and employees regarding the environment of your establishment. Are you ready to save money and update the look of your home or business? Browse HomElectrical’s website for LED products and accessories! What has been your experience with LED light bulbs?